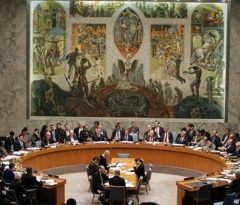 In October, Lebanon was elected to one of ten non-permanent member seats on the United Nations Security Council. Come January 2010, Lebanon will assume Asia’s “Arab League” seat, replacing Libya for a two-year term on the critical international body. Washington quietly opposed Lebanon’s candidacy. Senior administration officials were concerned about potential problems for the bilateral relationship that could arise from Lebanon’s voting decisions. While the pro-West March 14 coalition won the June 2009 elections, it was clear—even prior to the formation of the government in November—that Hezbollah and its local and international allies Syria and Iran would exert preponderant influence within the new government and the state’s foreign policy. Indeed, in the current government as with the previous one, Hezbollah—via its subsidiary Shiite party, Amal—controls the foreign ministry. It’s not difficult to envision the kind of problems that will ensue. In the coming year, for example, it is all but assured that a resolution to implement “crippling sanctions” against Iran will come before the Security Council. Given Hezbollah’s influence—and the ever present threat of violence—the best Washington could hope for during a UNSC vote would be a Lebanese abstention. More likely, under pressure from Syria and Iran, Lebanon might vote against such a resolution. Worse still, if history is any indication, Lebanon’s ambassador to the UN, Nawaf Salam—who himself is sympathetic to March 14—could be ordered to abstain or oppose Security Council resolutions in connection to UNSCRs 1701 and 1559, if not the Hariri tribunal, which Hezbollah and its allies do not support. On the sidelines of the summit that brought together the Lebanese President Michel Suleiman and Syrian President Bashar Assad in Damascus, Assad’s political and media advisor Buthaina Shaaban agreed with the delegation accompanying Suleiman to raise the level of coordination between Lebanon and Syria’s mission to the United Nation in New York, and that Syria will increase the number of its representatives (at the UN mission) to coincide with the Lebanese increase that came after Lebanon was elected a non-permanent member of the Security Council. So in addition to flexing its muscle in Beirut, according to Al-Akhbar, Damascus is looking to control Lebanon’s UN mission more closely. Given the potential pitfalls, Washington discouraged the government of Lebanon from moving forward, and reportedly even asked Riyadh to forward Saudi Arabia’s candidacy instead. Saudi Arabia wouldn’t bite, and Lebanon wouldn’t back down. So in January, Beirut will take its seat on the UNSC, a position that not only promises to annoy the administration and Congress—which has to sign off on the significant aid packages to Beirut—but also to be yet another source of increased tensions at home. While Lebanon’s international profile might be raised, it’s hard to see how the benefits to Beirut outweigh the downsides.